Below are our available online fire safety training courses. We offer a range of courses catering for large organisations, small businesses and even sole traders. They are aimed at all employees to assist them in identifying and reducing the risk that fire presents in the workplace. Each course conforms to current legislation (which applies to all workplaces regardless of the number of employees). Employers are legally required by Fire Safety Regulations (The Regulatory Reform Order 2005) to provide information, instruction and training to employees about fire precautions in the workplace. Logic4training’s online courses help you meet these requirements by providing you or your staff with the knowledge and understanding needed to act safely in the event of a fire in the workplace. The courses can be done in a matter of hours from the comfort of your own office. Our online training courses are for any business needing to train staff in fire safety procedures, if staff need fire extinguisher or if you need to train a fire marshal. We also have courses aimed at staff working in care homes. The courses can be taken by anyone, however, who wishes to learn how to prevent fire in the workplace and deal with it effectively should it occur. 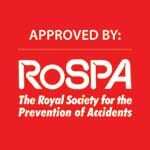 All our online fire safety training courses are ROSPA and IFE approved.